My weekend away was wonderful!!! It was all about meditation including workmeditation and walk meditation and to live in the present or mindfulness. I have met some very nice people and especially one person has touched my heart. I hope to tell you more about that very soon! I also celebrated my 52nd birthday on Sunday with all those nice people. That felt very special!! Before the program started at 7.30 am I had to stand in the middle of the circle and they all sang Happy Birthday to you and than gave me a big group hug. I just love hugs!!! I had brought some things from home to make 2 cakes and prepared these cakes during my workmeditation. The recipe is from the Fit for Life diet from Marylin Diamond. It's not an ordinary cake which you have to bake in the oven. The bottom is made with nuts, seeds and dried fruits and the filling is with fresh strawberries and bananas. On top there is some rasped (?) coconut. It's really a very yummie cake!!! I was home around 6 pm and at 7 my parents came by to congratulate me. And later that evening some other neighbours and friends also came by with congratulations and presents. Because the weather was very nice we could sit outside on the terrace. When it got dark I put on some candles and lit on a fire. It was a great and special 52nd birthday!! A birthday I won't forget, that's for sure!!! And yesterday I had to bring my son to his dad in Utrecht by train. He's going to spend a whole week with his dad! So, I'm free to do whatever and whenever I want to do! I'm going to have some fun this week!!! Planning on returning to the spiritual centre on Thursday evening and maybe sleep over there and attend another activity the next day. Looking forward to it!!! 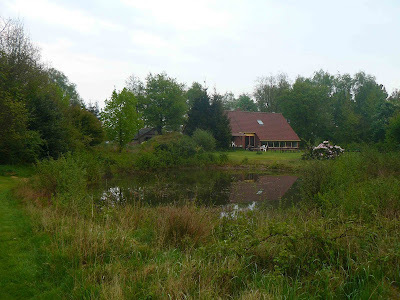 On the photo you can see the spiritual centre with the huge garden and pond. This photo was taken very early in the morning and it was raining a little bit. The rest of the weekend we had wonderful weather with lots of sun!! Gefeliciteerd!!! en wat fijn dat je het zo leuk hebt gehad!